C&IT joined event planners on a five-day fam trip to the Dominican Republic, discovering the Punta Cana area and Sanoa Island. Event professionals from UK agencies including Zibrant, Glow, CMM Events, Principal Global Events, American Express, BI Worldwide, Reed & Mackay, Penguins and Egencia were hosted by Melia Hotels International, Air Europa and Connect DMC last week (22-26 October), to explore the Caribbean island’s C&I offering. Following a flight on Air Europa from London Gatwick to the capital Santo Domingo via Madrid, the group transferred to Punta Cana, located in the east of the island, staying at the five-star The Level at Melia Caribe Tropical. The group enjoyed dinner and drinks at Cuatro restaurant on the first night. The itinerary on the second day included a site inspection of Melia Caribe Tropical, before the group departed for an afternoon aboard a pirate ship with Ocean Adventures. The group made a stop at a coral reef for snorkelling and then arrived at Shark Island, where activities including snorkelling with sharks and interacting with stingrays. In the evening, the group enjoyed dinner and cocktails at The Level. On the following day, the group transferred to the five-star Paradisus Palma Real, their base for the next two nights. Following an inspection of the hotel, the group also visited the five-star Paradisus Punta Cana and enjoyed a barbecue lunch in the hotel’s gardens. 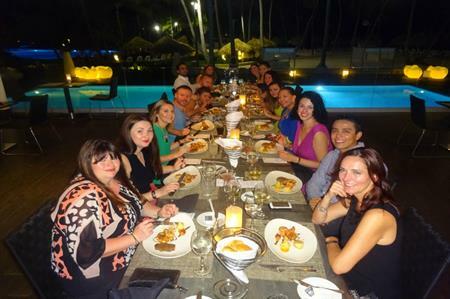 In the evening, dinner was hosted at Italian restaurant Aqua at The Reserve at Paradisus Palma Real. The itinerary also included a visit to the island of Saona on the south-east tip of the Dominican Republic.